Isn’t is astounding how a weekend can slip by so quickly? It seems so unfair, so unjust, that it can be that way. On Friday after work the weekend stretches out before you; endless possibilities, so many ideas and plans. Maybe Friday evening is dinner out, or a quiet night in so you can slowly un-clench from the week and begin to soak in the weekend. By Saturday morning, you’re ready for fun. You rush around, busy and energized: the farmers’ market, lunch with a friend, errands, and you need to get ready for Saturday night. You’re mid-weekend and you don’t even care that it’s half gone! Sunday morning arrives. It’s cozy and slow. Perhaps you sleep in, catch up on some laundry, maybe make, or go out for, a spectacular brunch, but it’s all done in slightly slow motion, like walking in sand. You begin to have to admit to yourself that tomorrow is Monday and it’s back to the usual routine. In an attempt to thwart off the impending week, you choose slow activities, you read, you clean, you take a leisurely stroll. You’re stalling, drawing each moment out so that the weekend can last just a minute or two longer. The end of the weekend often means slower foods, too. You take time to pour over the farmers’ market finds from Saturday when you were buzzing with optimism. You choose the ingredients more carefully; you dice the peppers into perfect squares, you set the table and sit, it’s a proper meal after all, but all the time you’re just stalling. On a Saturday you could stand by the sink and shovel your dinner in, too hot, too soon, not tasting, because it’s only Saturday and you still have so much to do with your weekend. Not so, Sundays. On Sunday, dinner can be crafted. Suddenly, you’re a chef, an artisan, a scholar of the kitchen and you willingly give in to languishing about or puttering as a roast turns to butter in a low oven over many hours. Or you stand, lazily stirring, stirring, stirring until a risotto is at its most beautiful, prepared to ooze effortlessly across your plate. Then you sit. Your plate looks back at you, promising nourishment, if not a temporary distraction from what comes next. Monday stays at bay as you tuck in to Sunday dinner. Maybe you are eating alone, peaceful, serene, contemplative. Perhaps your home’s family is there, the tradition of a Sunday dinner already ingrained, or still developing as a comforting tradition. Or maybe your home is bustling with grandparents, aunts, uncles, kids, dogs, family friends. It may not even be your home, you may be a guest. Whatever your Sunday dinner, take your time. Pause to see the colours on your plate. Smell all the aromas available to you, notice the details. Look around at the people you love and take a snap shot in your mind’s eye of that moment. It will never be here again and no energetic Saturday, nor regimented Monday can change that. Take pause, absorb, be thankful for what you have and let the moment linger. These Sunday dinner moments, they are what life is about. Bring 6 cups of chicken stock to a simmer in a saucepan. Once simmering, reduce the heat but keep the stock hot. In another large, heavy bottomed saucepan or skillet, over medium heat, saute the onions and bay, until the onion is translucent but not browned, about 5 minutes. Add the farro, stirring to coat it with the onions and oil. Add the red pepper. Cook, stirring constantly, for 5 minutes. Add the first cup of hot stock to the farro. 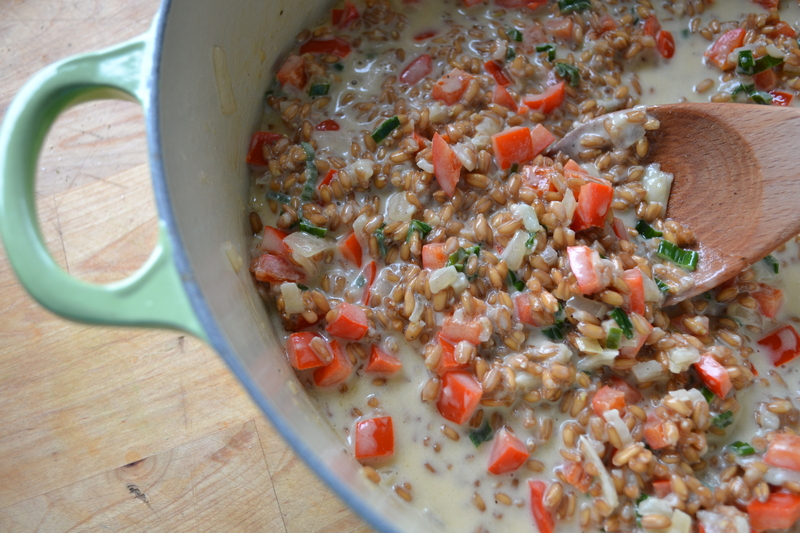 The pan with the farro should be hot enough that the warm stock simmers almost immediately. Cook, stirring occasionally until all the stock is aborbed by the farro, before adding the next cup. 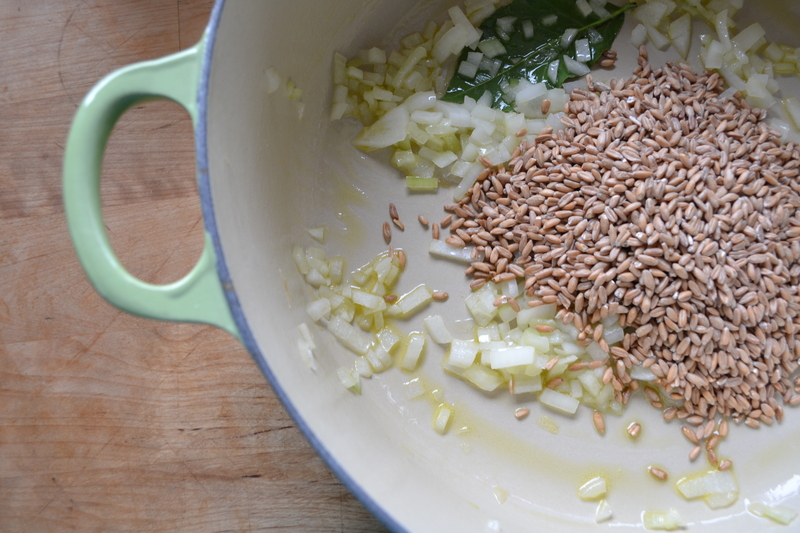 Continue until all the stock has been absorbed and the farro is tender. 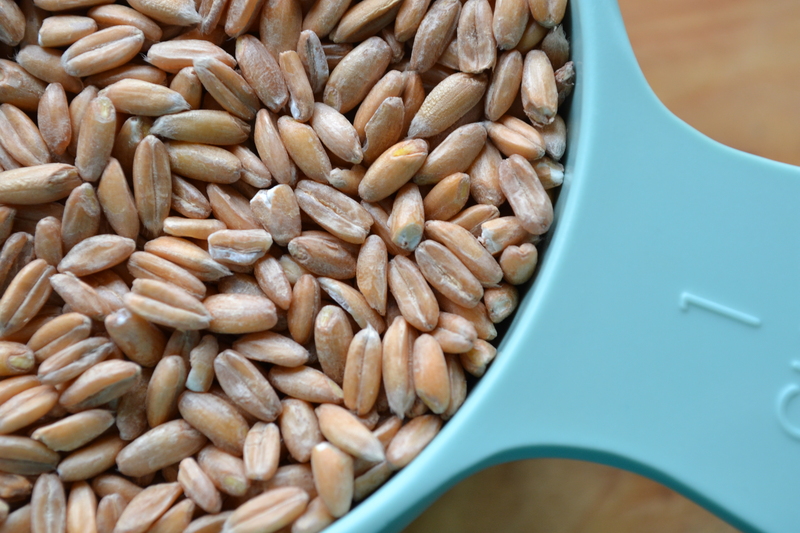 During cooking, the farro will emit a small amount of starch, thickening it, much like a rice risotto. Thicken it further by adding the parmesan cheese and milk, this will create a creamy sauce in and around the farro and peppers. Season to taste with salt and pepper (the cheese is salty so taste before you add any more ). Finish the dish by stirring in the scallions and squirting in a bit of lemon juice to brighten the flavours. Serve immediately and enjoy!